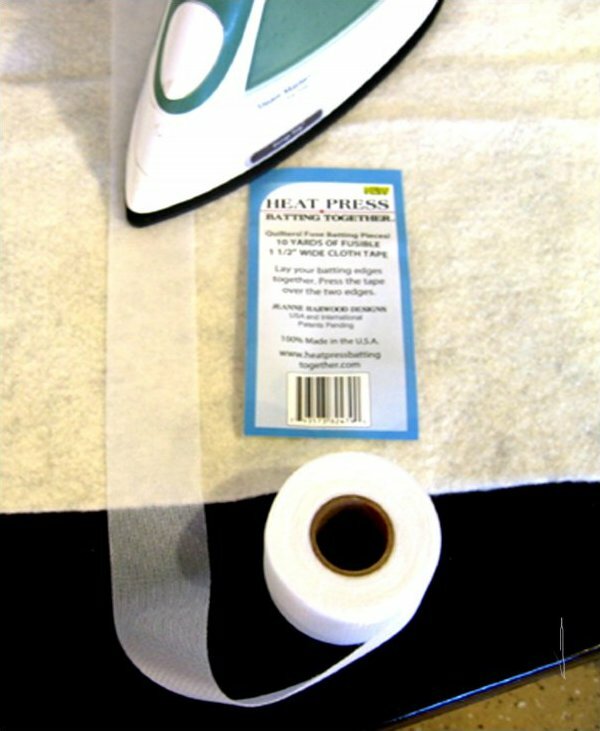 APPLIQUE TAPE.."steam it on, steam if off" 30yd x 1/4"
Iron Settings are Most Important when applying tape.�Irons with Teflon plates can use low cotton to fuse tape. Irons without a teflon plate use the new instructions below. Test your iron with Tape and batting. 100% polyester batting...low setting.. (high synthetic) and slide the heat of the iron across the batting quickly. �If needed use an appliqu� sheet over the tape on the high loft 100% polyester. You may find that the batting looks flat after application with the heat but when it cools the batting is fluffy again. With a large quilt batting 93� and adding more width, I use weights on either side of the batting to hold it in place. Simply lay tape over cut edges and slide the iron over the tape without any pressure � �smooth out the tape� with the heat of the iron. The batting tape needs only be applied to one side of the batting. It holds through washings and dry cleanings. It doesn�t gum up the needles and can be stitched by hand or by any machine. Copyright © 2007-2019 - HPBT Inc.